A bar mitzvah is an important time in the life of a young Jewish boy and his family. The party that follows is often an elaborate affair, much like a wedding reception. The reception decorations are an important part of the party and are what help make the venue festive and appropriate for the event. Bar mitzvahs, like weddings and birthday parties, often follow a particular theme. This theme usually reflects the interests and hobbies of the boy. Popular themes include sports video games and popular movies. 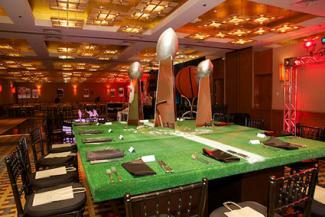 If the birthday boy is a big sports fan, consider using a sports theme for his bar mitzvah. Whether the boy is interested in a specific sport or team or in sports in general, you can incorporate these themes into your party decor. Football - Display large posters and pennants of the birthday boy's favorite team in the venue. You can also make poster sized images of the birthday boy playing in his little league team to frame and display. Use footballs as centerpieces and hang jerseys on the wall for decorations. Soccer - Hang large silhouettes of soccer players on the venue walls. You could also use soccer balls or soccer ball trophies as table centerpieces. Baseball - Scatter baseball cards on tables for a festive look. These cards can also double as a favor for guests who would have the chance to choose their favorite to take home. You can also use baseball caps from the bar mitzvah boy's favorite team. All sports - For a boy who likes all types of sports, consider combining the ideas from each of the sports themes. Choose green as a main color as many sports are played on a green field. You can incorporate any sport the guest of honor is interested in, including golf, tennis, basketball, or outdoor sports like fishing or hiking. A big time gamer would love a bar mitzvah that is based on video games or his favorite game in particular. Minecraft - Minecraft is a very popular game for kids and teens and might be the perfect theme if the guest of honor plays this game. Decorate the venue with cardboard boxes wrapped in green wrapping paper to reference the cubes that make up the game. You can also use square paper plates on walls to create Creepers and an Enderman. PacMan - If the child is into old time games such as PacMan, consider using this as your theme. Use cardboard to create large circles and cut a pie shaped piece out of it to create a PacMan figure. Be sure to paint it yellow and add a black painted eye. Another simple idea is to cover round tables with red and blue table cloths and cut large round eyes from white paper, with black marker eyes, to create ghosts. 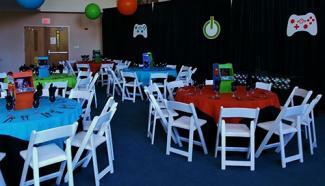 General video game theme - An avid gamer might enjoy a video game theme party. Use a large cardboard box, painted black or grey, to resemble a joystick or modern day controller. This piece can be used as a focal point for the party. Also, set up some wide screen televisions and gaming systems to serve both as decorations and activities. Most kids would love the idea of being a star for a day and a Hollywood theme party will be sure to put your child in the spotlight. Specific movie - Choose a specific movie that the honored boy enjoys and plan the party around it. Use movie posters to decorate walls and play the movie on a television at the venue. Star studded - Create a general Hollywood or movie theme by showing popular movies on several televisions around the party site and hanging glittering cardboard stars from the ceiling. Awards night - Make the guest of honor feel special by creating a red carpet event to rival the celebrity awards ceremonies in Hollywood. Lay red carpet runners on the floor and hire a paparazzi-style photographer not only to add to the atmosphere, but to help capture the event in photos. Print photos off and display them throughout the evening as part of the décor. 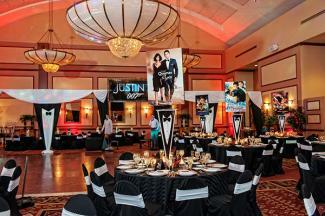 Creating bar mitzvah decorations can be a good way to save money and create a personalized look for the party. Create an entryway arch that not only serves as a decorative and dramatic way for guests to enter the party, but a way to honor the bar mitzvah boy. Choose 13 photographs of the young man, one for each year of the guest of honor's life, to display in a garland. Alternatively, look for 13 images of the boy with close friends and family members. If 13 photos won't fit on your arch, simply use a nice arrangement that fits well. Follow these easy steps to create your photo garland. First, decide where you are going to be displaying the photos. Ideally, you will have an arch or doorway in which you can attach (tape) the photos onto. If the venue does not have an arch or doorway, then consider using a garden arch for your display. Cut the poster board (or cardboard) into the shapes of large stars or another shape. You will need a star for each photograph. It's best to draw the shape onto the poster board before cutting it. It looks best to make the stars larger than the photos. You may even want to cut more stars than photographs and vary the sizes. Add glitter to the painted stars if you choose. If you would like to add the birthday boy's name to the top of the arch, cut a piece of cardboard to the length of the width of the header of the arch. Then use a pencil to draw the name in block letters and paint them. Attach the stars and header, if you made one, to the doorway or arch. Use double-faced tape (if you are allowed to use tape on the walls of the venue). After you have attached the stars, use tape or hot glue to attach the photographs to the stars. There are many ways to give your arch a finished look including adding smaller stars in between the larger stars and photos. You can also add a fringed curtain in the door of arch. 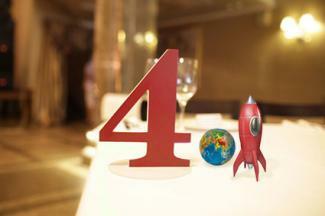 If you have chosen a theme for your celebration, use it to dictate which photos you choose. If you have a sports theme, then use photos of the guest of honor participating in various sports. If you have chosen a theme such as travel, use photos of the birthday boy at various travel destinations. If you don't have enough photos in your theme to create the arch, choose thirteen photographs of the bar mitzvah, one for each year of the guest of honor's life, to display. Or look for thirteen images of the boy with close friends and family members. Wreaths are not just for Christmas time. Create a large wreath that honors the bar mitzvah boy to hang behind him at the party venue or several smaller wreaths to hang all over the room. Follow these simple instructions to make a wreath for your celebration. Wrap the ribbon around the wreath. 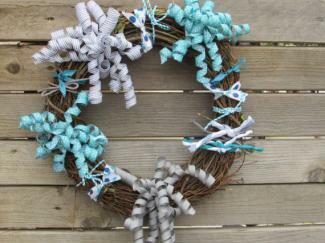 Leave a few inch gap between the ribbon rounds to show the grapevine wreath. Put a dot of hot glue on the end of the ribbon so it doesn't slip and put a dot of glue periodically under the ribbon. Attach the items you have selected to the wreath with hot glue. Create a bow and attach it to the wreath. The items you choose to attach to the wreath will make it a unique and appropriate decoration. A spy theme celebration can be represented by hot gluing magnifying glasses and dollar store sunglasses to the wreath. If you are hosting a luau, use small paper umbrellas, the type that typically found stuck in tropical drinks, to cover the entire surface of the wreath. You can even create a wreath out of theme specific items. Use a motorcycle or bicycle tire as the wreath base and adorn it with themed items. Use wood numbers, painted in the color scheme of the bar mitzvah, for decorative table numbers or to display the year of the celebration on a buffet table. Attach the letters to the plaque bases using a hammer and nails or hot glue gun, depending on the size and weight of the numbers. The plaques should be laying flat to serve as the base. Paint one side of the numbers first and then, after it is fully dry, paint the other side. Depending on the paint you use, you may have to apply several coats. Paint the plaque in a lighter or darker shade or in a complementary shade. Use two coats if needed. If you want your numbers to sparkle, sprinkle glitter on them while the paint is still wet. Display the numbers, along with other decorations and adornments in the center of the tables as table numbers or in the center of the buffet table as decoration. You can make the numbers theme specific by adding a variety of elements to them. Surround the numbers with fresh flowers or silk flowers in the color scheme of the party for an elegant affair. If you are planning a Star Wars or outer space event, surround the numbers with black tulle and silver stars or Star War figurines. If you do not want to create your decorations, there are some good commercial options. 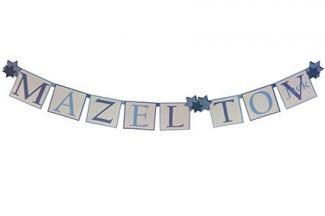 Mazel tov banner - Purchase a mazel tov banner to display at the venue. Mazel tov is a Jewish phrase that means "Congratulations." The price of this banner is $16 and can be customized. 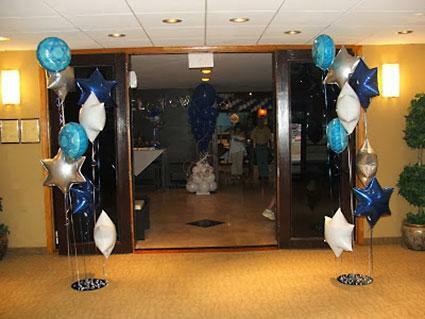 Bar mitzvah balloons - Decorate the party venue with a variety of bar mitzvah balloons from a variety of retailers. They range in price, but most are around $2 or $3 a piece. Mazel tov table scatter - Use this colorful confetti to add some glitter to the party tables. For under $2 (plus shipping) per package, you might want to pick up several packages. Bar mitzvah canvas guest book - Display this canvas on a tripod which can serve as a decoration and a guest book. This canvas can also be personalized and comes in a variety of sizes and prices ranging from $39 through $139. Mazel tov flags - Use these glittery flags as a centerpiece by putting it into a vase or you can use it as a photo booth prop. The price of the flags vary depending on the total number purchased. Use your theme to help decide on décor items. Use a graphic arts program to create a baseball card featuring the guest of honor and have it made into a custom wall mural. The price of the mural will vary depending on the size. Use a football table runner to decorate tables at the celebration. An affordable option, you can purchase a runner for each of the tables without going over budget. A baseball player standee will not only be a nice party decoration, but can be used as a photo booth item. This multi-sport wall decoration can be used to decorate for a general sport theme. The game of Minecraft has grass blocks as a prominent feature. These grass-like tissue paper mats can help to create a Minecraft look to your party venue. Revisit the heyday of arcade games by placing eight-inch arcade games in the center of each guest table. Decorate the venue walls with removable vinyl decals featuring game controllers. Let guests feel like stars by hanging this paparazzi wall decoration. The movie night red aisle runner can be used to lead guests into the reception venue. Buy several to be use in various areas such as outside or in the lobby. Use awards as centerpieces and to decorate various tables around the party venue. 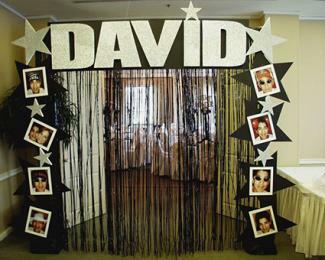 You don't necessarily have to use bar mitzvah specific decorations for your celebration. You can save money by using table cloths and table settings in a neutral or one of the party colors. Stack wrapped bar mitzvah party favors in the center of each table to double as centerpieces. Basic balloons and streamers can also be used to add color to the festivities.